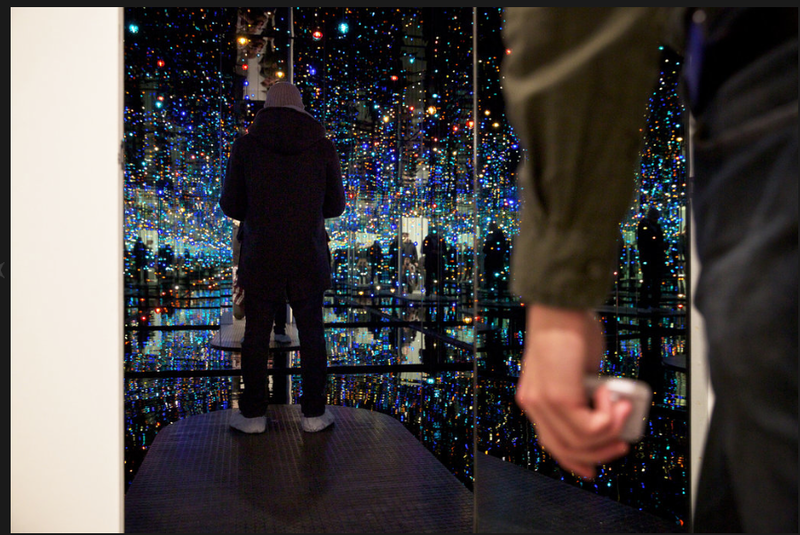 If you have recently looked at your Instagram feed, you have probably seen Yayoi Kusama’s “Infinity Mirrored Room- The Souls of Millions of Light Years Away” See a picture of a friend holding their phone and standing in a cosmic-like abyss filled dotted with twinkling light. Yes, that’s it. The New York Times recently wrote about the Yayoi Kusama show, “I Who Have Arrived in Heaven”, at David Zwirner Gallery which includes this installation that has been popping up all over social media. The “Infinity Mirrored Room” is a mirrored chamber filled with 75 colored LED bulbs that pulsate and visitors have been lining up daily outside the gallery for hours to spend just 45 seconds within. What I found interesting was the mention of how social media has encouraged more people to view the show especially those that normally aren’t in the gallery hopping demographic. Art lends itself so well to the photo sharing application and it is great to see art institution take advantage of it. Even though I have been a fan of Yayoi Kusama since seeing her retrospective at the Whitney (the fact that she strongly resembles my late grandmother might play a factor- no, my grandma did not have orange hair but still) I honestly don’t think I have the patience to stand in line for the experience. But, I plan on trying to get over there to see if the wait is worth it. At the very least I’d have a new profile picture.